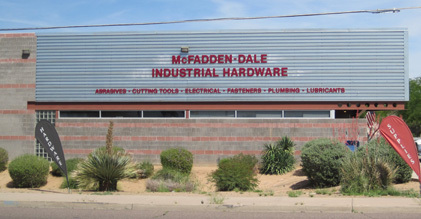 Join the hundreds of Arizona businesses that already utilize the valuable resource of McFadden-Dale Industrial Hardware! Working with all types of buisnesses in the Phoenix Metro area for over 26 years, we have thousands of in stock products and sizes. Call our order desk to reserve an item for pick up, or come in and check out our impressive inventory for yourself. No order too small or too large. We specialize in special orders. Challenge us for that hard to find item. If we don't have it in stock, we'll do our best to find it and give you a quote. We pride ourselves on our exceptional & experienced service. Call our customer service desk at 602-304-9141 for a stock check or quote today!